I ask the Blessed Beauty to assist you and confirm you. Wherever I go, you will be in my thoughts. I shall not forget any one of you. I beg of God that you may become more enlightened, more severed, more spiritual, more aflame and that you may be humble and submissive, for as long as man does not consider himself to be good but regards himself as weak and deficient, he progresses; but the moment he considers himself good and says, `I am perfect', he falls into pride and retrogresses. The principles of socialism are outstripped in the religions of God. For instance, God commands, `But [they] prefer them [the poor] before themselves, although there be indigence among them' [Qur'án 59:9]. That is, the believers spend of their substance and share their possessions and prefer others to themselves willingly and with utmost spirituality. Socialists, however, desire to enforce equality and association by compulsion. Although the preference for others which is the exhortation of God is more difficult because the rich are enjoined to prefer others to themselves, this will become common and will be the cause of tranquillity and an aid to the order of the world, because it depends upon the inclination and willingness of the giver. But socialism and egalitarianism, although easier, as those who have are made equal with others, yet such a system will not become widespread and is the cause of disturbance and tumult because it rests on compulsion and coercion. In the Tablets of Bahá'u'lláh it is mentioned that if a rich man neglects the duty of educating his children, the House of Justice is authorized to compel him to assist financially and to educate them. But this is a matter for the family of that wealthy man and comes under the jurisdiction of the House of Justice. The point is that there are matters greater than equality and socialism in divine religions. In the Cause of God there were persons like the King of Martyrs [Mírzá Muhammad-Hasan] who, in the days of tribulation, expended all their wealth and property to relieve the sufferings of the poor and the weak. In Persia the Bahá'ís were willing to sacrifice themselves for one another to such a degree that once when one of the Bahá'ís was a guest in the home of another believer, and the authorities demanded the arrest of the guest, the host gave the guest's name as his own and surrendered himself to them, was martyred in his place, thus sacrificing his life for his guest and brother. A newspaper must in the first instance be the means of creating harmony among the people. This is the prime duty of the proprietors of newspapers, to eradicate misunderstandings between religions and races and nationalities and promote the oneness of mankind. 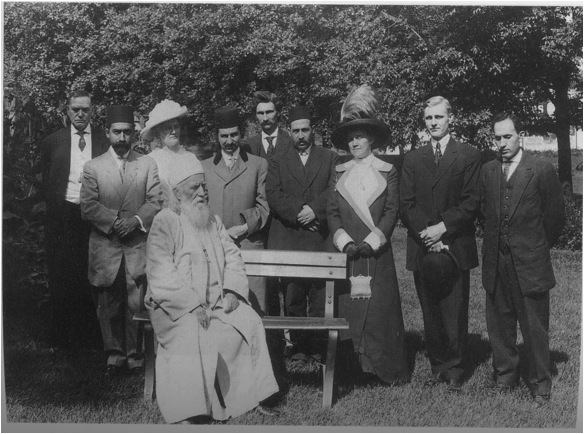 Mírzá `Alí-Akbar Nakhjavání [the father of Ali Nakhjavani and the middle man in the photo above], who had been granted permission to accompany `Abdu'l-Bahá on His journey to California, arrived from Malden, joining Mr Fujita, the Japanese, and the other servants. The train left Chicago at 10:00 a.m. Many of the friends had gathered at the railway station and surrounded the Master, begging for divine confirmations, blessings and assistance to render services to the Cause of God. At 9:00 in the evening, when the train was but a few stations away from Minneapolis, we were joined by Mr [Albert Heath] Hall and some friends. When we reached Minneapolis another group of friends and journalists received the bounty of seeing the Master. He told them that He was very tired and would see them the following morning to answer their questions and to give them material for their newspaper articles. We cannot stay more than two days. We come and in each city we create a stir, scatter some seeds, awaken the people, inform them of the Most Great Call and then leave. In this short space of time our work is to proclaim the Cause of God and, praise be to God, the results are evident day by day and accompanied by great confirmations." A striking day--with the Master promising to keep the friends in His thoughts, the talk on socialism, the amazing advice re. newspapers; the train ride on which the Master appeared to be in a trance-- chanting--the arrival in the beautiful city of Minneapolis, and the clear distillation of His purpose for visiting a place. We can feel the Master's fatigue and depression--but we cannot know the extent of His troubles. It is sad to think of Him weighed down, on this journey of light! Yet that is one of the miracles--despite the obstacles, He kept on going.